It gets crazier every day in the People's Republic of San Francisco. BART police finally identified the passenger as 42-year-old Oakland resident Tracy Daniels, reports ABC7 News. Officers arrested him on a felony no bail warrant. They found him after getting a call from Oakland resident Ron Thomas. 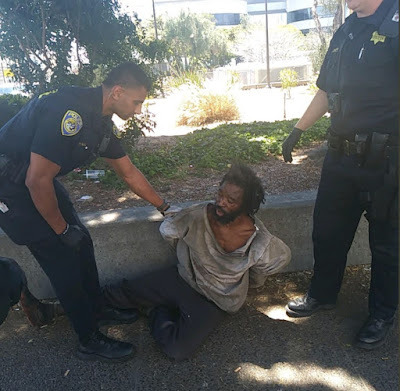 Thomas said he called police after seeing Daniels harass merchants near the Oakland-Lake Merritt BART station. He had also recognized him from the ABC7 News story that reported on Daniels repeatedly smoking meth on the train. So how did he violate the NAP? He is just another 'natural libertarian'. I'm sure Torres and the other anti white crowd here would love to have him as a roomie. Or are they really racist? I don't get it. Did he do something wrong? What might that be?